This past weekend Eric's car developed a clunking noise. I (Jason) always enjoy working on cars, so we took it for a drive and then removed the front tire to explore. We found a torn CV boot that eventually led us to diagnose a worn CV joint. I had to read about this on-line since I knew next to nothing about CV joints. We tried to obtain a second opinion, but we didn’t know any car gurus (and didn’t want to pay a mechanic to tell us). 90% sure of the diagnosis, I set out to replace the CV joint. I did not have all the ideal tools, but I improvised with what I had. I think it all went well, but truthfully I am slightly nervous, since Eric, Rachel and Maggie plan to drive this car around the country this summer. So where I am I going with this? Well, it struck me that this situation is likely analogous to what I will experience as a surgeon in the developing world. I will be doing operations I have never done before, where there will likely not be an expert available for consultation, so I will have to learn how to do the case from a book or the internet. I won’t have all the right instruments, so I will have to improvise, and I will probably operate on a friend at some point, making the whole experience just a bit more nerve-racking. Hopefully fixing Eric’s broken ankle in 10 years will go as smoothly as replacing the CV joint on his car! I have never made much of a secret of my life ambition to be in a magazine that featured Beyonce on the cover. 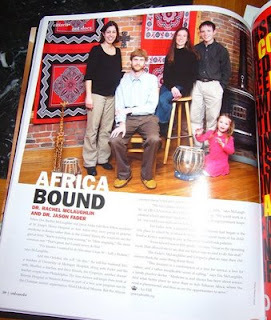 However, I thought when I decided to pursue a career in African medical missions, that I would have to put that aside. But no! This month's Ambassador magazine, a Detroit-area publication, had its annual 'hot docs' section (a series of personal interest stories for area physicians, and a somewhat embarrassing title for said 'docs'), and the Mc---Ders found their way into it, with a photo shoot in the McKitchen, and a few words from the crew. 1. Why was Beyonce on the cover? She was filming a movie in the Detroit area, apparently. 2. Did you notice that Eric is wearing slippers, and that they called him 'Erica'? Yes, we did. 3. Did you have to take a lot of photos to get such a cute picture of Anna staring at the camera? Well, they were all cute, but the 'staring at the camera' took a while. Huge huge thanks to Duc and Janet Tang for taking the McCropders out to their fantastic restaurant last night! The Cropseys are back in town for a week, and thus we are reunited. 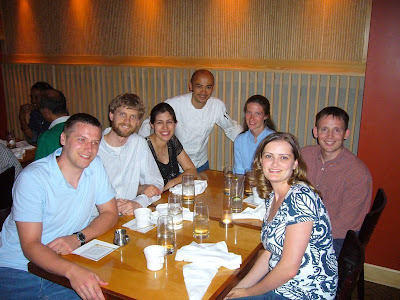 The Tangs, a wonderful couple from Knox, run Pacific Rim, in our humble opinion, the finest of the myriad of Ann Arbor fine dining institutions. They invited us out for a fantastic meal. It was all good, but since I (Eric) am writing this, it will have to be said: Frequent this venue, and don't miss the quail and the tuna. Thanks very much, Duc and Janet, you have blessed us. Surprised and very happy, the Faders find themselves in Ethiopia this week. This picture shows the view from our hotel room. More than a year ago, we began the process of adoption, and now we have met the little girl who will hopefully join our family very soon!! Less than two weeks ago, we joyfully accepted the referral for this precious baby! After a very short whirlwind of preparation, we boarded a plane for Addis Ababa in order to complete the next phase of the adoption process. This new little girl is absolutely beautiful, five months old, very tiny, a bit malnourished. We held her yesterday and today, trying to fill her with all the love in our hearts. She seemed to be studying us, rather unimpressed with our singing actually, but she did not mind the affection. Pictures of this sweet little girl will certainly be featured on this blog after we have passed all legal proceedings. We pray that God will open the doors for the final legal proceedings to be finished quickly, so that she can come home to us within a few months. Please join us in praying for her to come home soon. One major obstacle that many healthcare professionals face as they consider career medical missions is the burden of educational debt. Project MedSend was created when mission agencies began having difficulty recruiting healthcare professionals due to the dramatic rise in educational costs. MedSend offers student loan repayment grants for healthcare professionals (nurses, physicians, dentists, and technicians) who are serving as medical missionaries with a recognized missions sending agency. The Cropseys and McLaughlins both applied for MedSend grants last year. We recently found out that both families have been accepted! (The Faders did not require such assistance due to their extreme thriftiness, as mentioned in a previous blog.) We are very grateful to MedSend and its donors. Without their support, we would most likely be in the States for at least several more years in order to pay off our student loans. Now that we have been accepted as grant recipients, MedSend will begin the process of raising funds for our grants. Please pray that those funds would come in quickly. Project MedSend will be hosting a dinner at Knox Presbyterian Church in Ann Arbor, Michigan on Thursday, May 21st. If you are interested in attending this dinner, please contact one of the McCropders. God has blessed us. Some pictures here.